The 14th Parliament of Sri Lanka was a meeting of the Parliament of Sri Lanka, with the membership determined by the results of the 2010 parliamentary election held on 8 April and 20 April 2010. The parliament met for the first time on 22 April 2010 and was dissolved on 26 June 2015. Winners of polling divisions. 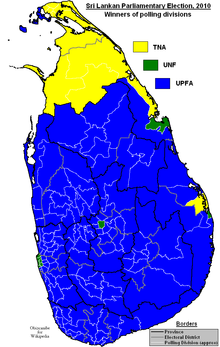 UPFA in blue, UNF in green and TNA in yellow. The 14th parliamentary election was held on 8 April and 20 April 2010. The incumbent United People's Freedom Alliance (UPFA) secured a landslide victory in the elections, buoyed by its achievement of ending the 26 year Sri Lankan Civil War by defeating the Liberation Tigers of Tamil Eelam in May 2009. The UPFA won a large majority in parliament, obtaining 144 seats, an increase of 39 since the 13th parliamentary election. The main opposition United National Front (UNF) won 60 seats, a decline of 22. The minority Tamil party Tamil National Alliance (TNA) won 14 seats, a decline of 8, and the Democratic National Alliance (DNA), contesting for the first time, won 7 seats. The new parliament was sworn in on 22 April 2010. Chamal Rajapaksa, the brother of President Rajapaksa, was elected Speaker, Piyankara Jayaratne as the Deputy Speaker and Murugesu Chandrakumar as the Deputy Chairman of Committees. Ranil Wickremesinghe was recognised as Leaders of the Opposition. John Amaratunga was appointed as the Chief Opposition Whip. On 2 May 2010 the government appointed Nimal Siripala de Silva as the Leader of the House and Dinesh Gunawardena as the Chief Government Whip. Chandima Weerakkody was elected Deputy Speaker on 23 November 2010 after his predecessor Piyankara Jayaratne was made a minister. On 21 April 2010 President Rajapaksa appointed D. M. Jayaratne as the new Prime Minister. The rest of the government, comprising 36 Ministers and 39 Deputy Ministers were sworn in on 23 April 2010. President Rajapaksa has retained control of the important ministries of Defence, Finance & Planning, Highways, and Ports & Aviation. Mervyn Silva resigned as Deputy Minister of Mass Media & Information on 5 May 2010. A further four Ministers and five Deputy Ministers were sworn in on 5 May 2010. Mervyn Silva was appointed as the new Deputy Minister of Highways. 85 UPFA MPs were now part of the government. Mervyn Silva was dismissed from his ministerial post and suspended from the SLFP on 10 August 2010. However, a subsequent SLFP disciplinary cleared him of all charges and on 8 September 2010 he was reappointed to his ministerial post. On 22 November 2010, three days after Rajapaksa was sworn in for his second term, a new government was sworn in. A number of opposition MPs who had defected to the UPFA were rewarded with ministerial posts. A further Minister and three Deputy Ministers were sworn in on 25 November 2010 95 UPFA MPs were now part of the government. S. M. Chandrasena resigned as Minister of Agrarian Services & Wildlife with effect from 26 September 2012. He was appointed Deputy Minister of Agrarian Services & Wildlife on 5 October 2012. President Rajapaksa carried out a cabinet re-shuffle on 28 January 2013, appointing some new ministers and deputy ministers. 96 UPFA MPs were now part of the government. Nine new deputy ministers were appointed on 10 October 2013. 105 UPFA MPs were now part of the government (Prime Minister + 10 Senior Ministers + 54 Ministers + 2 Project Ministers + 38 Deputy Ministers (excludes Sarath Amunugama who is also a Senior Minister)). Deputy Economic Development Minister S. M. Chandrasena was appointed as Cabinet Minister for Special Projects on 23 November 2013. Palani Digambaran and Praba Ganesan were appointed deputy ministers on 21 August 2014. V. Radhakrishnan was appointed deputy minister on 9 October 2014. Maithripala Sirisena defeated Mahinda Rajapaksa at the 2015 presidential election after which he appointed a UNP dominated national government (NG). Light shading indicates majority (113 seats or more); dark shading indicates two-thirds majority (150 seats or more); no shading indicates minority government. 22 April 2010 - National Union of Workers (NUW) left the United National Front alliance after a dispute over National List seats. Palani Digambaran, their sole MP, is to function as an independent MP. 4 August 2010 - Sri Lanka Freedom Party (People's wing) dissolved. Its sole MP Mangala Samaraweera joined the United National Party on 6 August 2010. 5 August 2010 - Palani Digambaran of the NUW and Praba Ganesan of the Democratic People's Front (DPF) cross over to the UPFA. It was reported that Ganesan was suspended from the DPF. 27 August 2010 - Sri Lanka Muslim Congress (SLMC) decides to support the government on constitutional changes, including removing the two-term limit on the presidency, whilst remaining in opposition. The SLMC's eight MPs will give the government the two-thirds majority needed in Parliament to amend the constitution. 8 September 2010 - Six United National Party (UNP) MPs (A. R. M. Abdul Cader, Earl Gunasekara, Manusha Nanayakkara, Lakshman Senewiratne, Upeksha Swarnamali and Nimal Senarath Wijesinghe) cross over to the UPFA during the 18th amendment debate. They were suspended from the UNP. 8 September 2010 - Tamil National Alliance MP Podiappuhamy Piyasena joins the UPFA. 11 September 2010 - V. Radhakrishnan quits the Ceylon Workers' Congress (CWC) to sit as an independent MP supporting UPFA. 7 October 2010 - V. Radhakrishnan joins the Up-Country People's Front (UCPF). 22 November 2010 - SLMC (eight MPs) joins UPFA. The SLMC's High Command had decided on 12 November 2010 to join the UPFA. 24 December 2010 - Achala Jagodage is expelled from the National Freedom Front. 30 November 2011 - UNP MP Mohan Lal Grero crosses over to the ruling UPFA. He is rewarded by being appointed Monitoring MP for the Ministry of Education. 15 November 2012 - DNA MP Ajith Kumara becomes an independent MP. Kumara had been suspended from the JVP in 2011 for supporting the breakaway group (subsequently called the Frontline Socialist Party). 8 August 2013 - Perumal Rajadurai quits the CWC to sit as an independent MP supporting UPFA. 18 November 2014 - Jathika Hela Urumaya (JHU) (three MPs) leaves UPFA. 20 November 2014 - UPFA MP Wasantha Senanayake joins the UNP. 21 November 2014 - UPFA minister Maithripala Sirisena resigns from the UPFA government to contest the presidential election. He is joined by five other UPFA MPs - Duminda Dissanayake, M. K. D. S. Gunawardena, Rajitha Senaratne and Rajiva Wijesinha. 21 November 2014 - Perumal Rajadurai resigns from the UPFA. He joins the UNP on 25 November 2014. 26 November 2014 - UPFA MP Hunais Farook joins the UNP. 30 November 2014 - UPFA MP Navin Dissanayake resigns from the UPFA. 8 December 2014 - UNP MP Tissa Attanayake and Democratic Party MP Jayantha Ketagoda join the UPFA. Attanayake is rewarded by being appointed Minister of Health on 11 December 2014. 10 December 2014 - Palani Digambaran and V. Radhakrishnan resign from the UPFA. 22 December 2014 - All Ceylon Muslim Congress (ACMC) (two MPs) leaves UPFA. The third ACMC MP (M. L. Alim Mohammad Hisbullah) remains in the government. 28 December 2014 - SLMC (eight MPs) leaves UPFA. 31 December 2014 - Faiszer Musthapha resigns from the UPFA. 1 January 2015 - Nandimithra Ekanayake resigns from the UPFA. 17 March 2015 - Rajiva Wijesinha leaves the national government and crosses over to the opposition. 18 March 2015 - Arjuna Ranatunga joins the SLFP. 22 March 2015 - 27 UPFA MPs, mostly from the SLFP, join the national government. 2 April 2015 - Deputy Minister Tissa Karalliyadde leaves the national government. 5 April 2015 - UPFA MP P. Dayaratna joined UNP in Ampara. 21 May 2015 - One cabinet minister and three state ministers leave the national government. 29 May 2015 - Three UPFA MPs join the national government. 10 June 2015 - Four UPFA MPs join the national government. 7 October 2010 - Sarath Fonseka (DNA-COL) vacated his seat after being sentenced to 30 months imprisonment by a court martial after being found guilty of breaching arms procurement guideline. His replacement Jayantha Ketagoda (DNA-COL) was sworn in on 8 March 2011. 2 December 2010 - Noordeen Mashoor (UPFA-VAN) died. His replacement Muthali Bawa Farook (UPFA-VAN) was sworn in on 5 January 2011. 24 September 2012 - Malini Fonseka (UPFA-NAT) resigned. She was sworn in again on 9 October 2012. 30 May 2013 - Jayalath Jayawardena (UNP-GAM) died. His replacement Ajith Mannapperuma (UNP-GAM) was sworn in on 4 June 2013. 24 July 2013 - Dayasiri Jayasekara (UNP-KUR) resigns to contest the North Western provincial council elections. His replacement Nilantha Bandara (UNP-KUR) was sworn in on 8 August 2013. 5 August 2014 - Harin Fernando (UNP-BAD) resigns to contest the Uva provincial council elections. His replacement K. Velayudam (UNP-BAD) was sworn in on 8 August 2014. 28 November 2014 - A. H. M. Azwer (UPFA-NAT) resigns to allow an All Ceylon Makkal Congress member to be appointed. His replacement Ameer Ali (UPFA-NAT) was sworn in on 12 December 2014. 9 January 2015 - Maithripala Sirisena (UPFA-POL) resigned to take up presidency. His replacement Jayasinghe Bandara (UPFA-POL) was sworn in on 29 January 2015. 12 May 2015 - Neranjan Wickramasinghe (UPFA-KUR) died. His replacement R. D. Wimaladasa (UPFA-KUR) was sworn in on 20 May 2015. Rohitha Abeygunawardena KAL 77,205 22 April 2010 26 June 2015 SLFP UPFA SLFP UPFA Deputy Minister of Ports & Aviation (10). Deputy Minister of Ports & Highways (10-13). Project Minister of Ports & Highways (13-15). Lakshman Yapa Abeywardena MTR 67,510 22 April 2010 26 June 2015 UNP (D) UPFA NG Deputy Minister of Economic Development (10-13). Minister of Investment Promotion (13-15). Deputy Minister of Aviation Services (15-). Minister of Parliamentary Affairs (15-). Mahinda Yapa Abeywardena MTR 70,439 22 April 2010 26 June 2015 SLFP UPFA SLFP UPFA Minister of Agriculture (10-15). Minister of Parliamentary Affairs (15). Lasantha Alagiyawanna GAM 65,939 22 April 2010 26 June 2015 SLFP UPFA SLFP NG Deputy Minister of Construction, Engineering Services, Housing & Common Amenities (10-15). Deputy Minister of Rural Economic Affairs (15-). Dullas Alahapperuma NAT 22 April 2010 26 June 2015 SLFP UPFA SLFP UPFA Minister of Youth Affairs (10-15). Ameer Ali NAT 12 December 2014 26 June 2015 ACMC UPFA ACMC NG Replaces A. H. M. Azwer. Deputy Minister of Housing and Samurdhi (15-). Hasen Ali NAT 22 April 2010 26 June 2015 SLMC UNF SLMC NG State Minister of Health (15-). Mahindananda Aluthgamage KAN 146,765 22 April 2010 26 June 2015 SLFP UPFA SLFP UPFA Deputy Minister of Youth Affairs (10). Minister of Sport (10-15). Wasantha Aluvihare MTL 31,529 22 April 2010 26 June 2015 UNP UNF UNP NG Deputy Minister of Mahaweli Development and Environment (15-). John Amaratunga GAM 52,331 22 April 2010 26 June 2015 UNP UNF UNP NG Chief Opposition Whip (10-). Minister of Public Order, Disaster Management and Christian Affairs (15-). Mahinda Amaraweera HAM 105,414 22 April 2010 26 June 2015 SLFP UPFA SLFP NG Deputy Minister of Health (10). Minister of Disaster Management (10-15). Minister of Fisheries (15-). Sarath Amunugama KAN 44,478 22 April 2010 26 June 2015 SLFP UPFA SLFP NG Deputy Minister of Finance & Planning (10). Senior Minister of International Monetary Co-operation (10-15). Deputy Minister of Finance & Planning (12-15). Minister of Higher Education and Research (15-). A. H. M. Azwer NAT 22 April 2010 28 November 2014 SLFP UPFA SLFP UPFA Resigned. Replaced by Ameer Ali. A. L. M. Athaullah AMP 36,943 22 April 2010 26 June 2015 NC UPFA NC UPFA Minister of Local Government and Provincial Councils (10-15). Tissa Attanayake NAT 22 April 2010 26 June 2015 UNP UNF UPFA Minister of Health (14-15). Thalatha Atukorale RAT 64,592 22 April 2010 26 June 2015 UNP UNF UNP NG Minister of Foreign Employment (15-). Rishad Bathiudeen VAN 27,461 22 April 2010 26 June 2015 ACMC UPFA ACMC NG Minister of Industry and Commerce (10-14), (15-). Jagath Balasuriya KEG 47,294 22 April 2010 26 June 2015 SLFP UPFA SLFP UPFA Deputy Minister of Labour & Productivity Improvement (10). Minister of National Heritage (10-15). Jayasinghe Bandara POL 21,876 29 January 2015 26 June 2015 UPFA UPFA Replaces Maithripala Sirisena. K. W. Shantha Bandara KUR 86,353 22 April 2010 26 June 2015 SLFP UPFA SLFP NG Deputy Minister of Media (15-). Nilantha Bandara KUR 29,669 8 August 2013 26 June 2015 UNP UNP NG Replaces Dayasiri Jayasekara. R. M. Ranjith Madduma Bandara MON 15,105 22 April 2010 26 June 2015 UNP UNF UNP NG Minister of Internal Transport (15-). Indika Bandaranaike KUR 48,665 22 April 2010 26 June 2015 UNP (D) UPFA UPFA Deputy Minister of Local Government & Provincial Councils (10-15). Pandu Bandaranaike GAM 49,613 22 April 2010 26 June 2015 SLFP UPFA SLFP NG Deputy Minister of Indigenous Medicine (10-15). State Minister of Public Administration and Democratic Governance (15-). A. R. M. Abdul Cader KAN 54,937 22 April 2010 26 June 2015 UNP UNF UPFA Deputy Minister of Environment (10-13). Deputy Minister of Environment & Renewable Energy (13-15). Murugesu Chandrakumar JAF 8,105 22 April 2010 26 June 2015 EPDP UPFA EPDP UPFA Deputy Chairman of Committees (10-). S. M. Chandrasena ANU 112,644 22 April 2010 26 June 2015 SLFP UPFA SLFP UPFA Deputy Minister of Irrigation & Water Resources Management (10). Minister of Agrarian Services & Wildlife (10-12). Deputy Minister of Agrarian Services & Wildlife (12-13). Deputy Minister of Economic Development (13-15). Cabinet Minister for Special Projects (13-15). Reginald Cooray KAL 60,196 22 April 2010 26 June 2015 SLFP UPFA SLFP NG Deputy Minister of Justice (10). Minister of Minor Export Promotion (10-15). Minister of Aviation Services (15-). Wijaya Dahanayaka MTR 44,463 22 April 2010 26 June 2015 SLFP UPFA SLFP NG Deputy Minister for Public Administration (10-15). Deputy Minister of Public Order and Christian Religious Affairs (15-). Basheer Segu Dawood BAT 11,678 22 April 2010 26 June 2015 SLMC UNF SLMC NG Deputy Minister of Co-operatives & Internal Trade (10-13). Minister of Productivity Promotion (13-14). P. Dayaratna AMP 32,915 22 April 2010 26 June 2015 UNP (D) UPFA UNP NG Minister of State Resources and Enterprise Development (10). Senior Minister of Food & Nutrition (10-15). Harsha de Silva NAT 22 April 2010 26 June 2015 UNP UNF UNP NG Deputy Minister of Policy Planning, Economics Affairs, Child, Youth and Cultural Affairs (15-). Nimal Siripala de Silva BAD 141,990 22 April 2010 26 June 2015 SLFP UPFA SLFP UPFA Leader of the House (10-15). Minister of Irrigation and Water Resources Management (10-15). Leader of the Opposition (15-). Douglas Devananda JAF 28,585 22 April 2010 26 June 2015 EPDP UPFA EPDP UPFA Minister of Traditional Industries and Small Enterprise Development (10-15). Palani Digambaran NUW 39,490 22 April 2010 26 June 2015 NUW UNF NUW NG Deputy Minister of National Languages & Social Integration (14). Minister of Plantation Infrastructure Development (15-). Duminda Dissanayake ANU 101,384 22 April 2010 26 June 2015 SLFP UPFA SLFP NG Deputy Minister of Posts & Telecommunication (10). Deputy Minister of Youth Affairs & Skills Development (10-13). Minister of Education Services (13-14). Minister of Irrigation and Agriculture (15-). Lalith Dissanayake KEG 49,224 22 April 2010 26 June 2015 SLFP UPFA SLFP NG Deputy Minister of Technology & Research (10). Deputy Minister of Health (10-15). Deputy Minister of Irrigation (15-). Navin Dissanayake NUW 43,514 22 April 2010 26 June 2015 UNP (D) UPFA UNP NG Minister of Public Management Reforms (10-14). Minister of Tourism and Sports (15-). P. Weerakumara Dissanayake ANU 27,102 22 April 2010 26 June 2015 NFF UPFA NFF UPFA Deputy Minister of Traditional Industries & Small Enterprise Development (10-15). Rohana Dissanayake MTL 32,803 22 April 2010 26 June 2015 SLFP UPFA SLFP UPFA Deputy Minister of Transport (10-15). Salinda Dissanayake KUR 56,842 22 April 2010 26 June 2015 SLFP UPFA SLFP UPFA Deputy Minister of Plantation & Industries (10). Minister of Indigenous Medicine (10-15). S. B. Dissanayake KAN 108,169 22 April 2010 26 June 2015 UNP (D) UPFA NG Minister of Higher Education (10-15). Minister of Rural Economic Affairs (15-). Nandimithra Ekanayake MTL 35,754 22 April 2010 26 June 2015 UNP (D) UPFA NG Deputy Minister of Higher Education (10-14). State Minister of Culture and Arts (15-). T. B. Ekanayake KUR 112,420 22 April 2010 26 June 2015 SLFP UPFA SLFP UPFA Deputy Minister of Education (10). Minister of Culture and the Arts (10-15). W. B. Ekanayake ANU 40,634 22 April 2010 26 June 2015 UNP (D) UPFA UPFA Deputy Minister of Disaster Management (10). Deputy Minister of Irrigation & Water Resources Management (10-15). Muthali Bawa Farook VAN 2,456 5 January 2011 26 June 2015 SLMC UPFA SLMC NG Replaces Noordeen Mashoor. Harin Fernando BAD 49,073 22 April 2010 5 August 2014 UNP UNF UNP Resigned. Replaced by K. Velayudam. Johnston Fernando KUR 136,943 22 April 2010 26 June 2015 UNP (D) UPFA UPFA Minister of Co-operatives and Internal Trade (10-15). Milroy Fernando PUT 31,509 22 April 2010 26 June 2015 SLFP UPFA SLFP UPFA Minister of Resettlement (10). Senior Minister of Social Welfare (10-15). Sudarshani Fernandopulle GAM 186,140 22 April 2010 26 June 2015 SLFP UPFA SLFP NG Deputy Minister of Higher Education and Research (15-). Malini Fonseka NAT 22 April 2010 24 September 2012 SLFP UPFA SLFP UPFA Resigned. Replaced by Malini Fonseka. Malini Fonseka NAT 9 October 2012 26 June 2015 SLFP UPFA SLFP UPFA Replaces Malini Fonseka. Sarath Fonseka COL 98,458 22 April 2010 7 October 2010 DNA Vacated seat. Replaced by Jayantha Ketagoda. A. H. M. Fowzie COL 51,641 22 April 2010 26 June 2015 SLFP UPFA SLFP NG Minister of Disaster Management (10). Senior Minister of Urban Affairs (10-15). Minister of Disaster Management (15-). Chandrasiri Gajadeera MTR 51,742 22 April 2010 26 June 2015 CPSL UPFA CPSL UPFA Deputy Minister of Finance & Planning (10). Minister of Rehabilitation and Prison Reforms (10-15). Anoma Gamage NAT 22 April 2010 26 June 2015 UNP UNF UNP NG Deputy Minister of Irrigation and Agriculture (15-). Piyasena Gamage GAL 67,033 22 April 2010 26 June 2015 SLFP UPFA SLFP NG Minister of Indigenous Medicine (10). Senior Minister of National Resources (10-15). Minister of Skill Development and Vocational Training (15-). Siripala Gamalath POL 53,973 22 April 2010 26 June 2015 SLFP UPFA SLFP UPFA Deputy Minister of Lands & Land Development (10-15). Praba Ganesan COL 42,851 22 April 2010 26 June 2015 DPF UNF UPFA Deputy Minister of Telecommunication & Information Technology (14-15). Dunesh Gankanda RAT 34,219 22 April 2010 26 June 2015 UNP UNF UNP NG Deputy Minister of Urban Development, Water Supply and Drainage Board (15-). Mohan Lal Grero COL 68,008 22 April 2010 26 June 2015 UNP UNF UPFA Deputy Minister of Education (13-15). Sarath Kumara Gunaratna GAM 46,040 22 April 2010 26 June 2015 SLFP UPFA SLFP UPFA Deputy Minister of State Resources & Enterprise Development (10-13). Deputy Minister of Fisheries & Aquatic Resources Development (13-15). Earl Gunasekara POL 26,925 22 April 2010 26 June 2015 UNP UNF UPFA Deputy Minister of Plantation & Industries (10-15). Hemal Gunasekara MTR 51,013 22 April 2010 26 June 2015 SLFP UPFA SLFP NG Deputy Minister of Cooperative & Internal trade (13-15). State Minister of Housing and Samurdhi (15-). D. E. W. Gunasekera NAT 22 April 2010 26 June 2015 CPSL UPFA CPSL UPFA Minister of Rehabilitation and Prison Reforms (10). Senior Minister of Human Resources (10-15). Bandula Gunawardena COL 64,654 22 April 2010 26 June 2015 UNP (D) UPFA UPFA Minister of Education (10-15). Dinesh Gunawardena COL 116,860 22 April 2010 26 June 2015 MEP UPFA MEP UPFA Chief Government Whip (10-15). Minister of Water Supply and Drainage (10-15). Gitanjana Gunawardena NAT 22 April 2010 26 June 2015 MEP UPFA MEP UPFA Deputy Minister of External Affairs (10). Deputy Minister of Finance & Planning (10-12). Deputy Minister of Civil Aviation (12-15). M. K. D. S. Gunawardena TRI 19,734 22 April 2010 26 June 2015 SLFP UPFA SLFP NG Deputy Minister of Buddhasasana & Religious Affairs (10-14). Minister of Lands (15-). Sarana Gunawardena GAM 61,150 22 April 2010 26 June 2015 SLFP UPFA SLFP UPFA Deputy Minister of Petroleum Industries (10-15). Rauff Hakeem KAN 54,097 22 April 2010 26 June 2015 SLMC UNF SLMC NG Minister of Justice (10-14). Minister of Urban Development, Water Supply and Drainage (15-). M. H. A. Haleem KAN 46,240 22 April 2010 26 June 2015 UNP UNF UNP NG Minister of Muslim Religious Affairs and Posts (15-). P. Harrison ANU 24,675 22 April 2010 26 June 2015 UNP UNF UNP NG Minister of Social Services, Welfare and Livestock Development (15-). Kabir Hashim KEG 48,344 22 April 2010 26 June 2015 UNP UNF UNP NG Minister of Highways, Higher Education and Investment Promotion (15-). Jayarathna Herath KUR 64,645 22 April 2010 26 June 2015 SLFP UPFA SLFP UPFA Deputy Minister of Industry & Commerce (10-13). Minister of Botanical Gardens & Public Recreation (13-15). M. L. Alim Mohammad Hisbullah BAT 22,256 22 April 2010 26 June 2015 ACMC UPFA UPFA Deputy Minister of Child Development & Women's Affairs (10-13). Deputy Minister of Economic Development (13-15). D. M. Jayaratne NAT 22 April 2010 26 June 2015 SLFP UPFA SLFP UPFA Prime Minister (10-15). Minister of Buddhasasana and Religious Affairs (10-15). Piyankara Jayaratne PUT 56,098 22 April 2010 26 June 2015 SLFP UPFA SLFP UPFA Deputy Speaker & Chairman of Committees (10). Minister of Civil Aviation (10-15). Dayasiri Jayasekara KUR 132,949 22 April 2010 24 July 2013 UNP UNF UNP Resigned. Replaced by Nilantha Bandara. Premalal Jayasekara RAT 73,175 22 April 2010 26 June 2015 SLFP UPFA SLFP UPFA Deputy Minister of Power & Energy (10-15). Sumedha G. Jayasena MON 45,837 22 April 2010 26 June 2015 SLFP UPFA SLFP UPFA Minister of Parliamentary Affairs (10-15). Chandrani Bandara Jayasinghe ANU 29,884 22 April 2010 26 June 2015 UNP UNF UNP NG Minister of Women’s Affairs (15-). Karu Jayasuriya GAM 60,310 22 April 2010 26 June 2015 UNP UNF UNP NG Minister of Buddha Sasana (15-). Minister of Public Administration, Provincial Councils, Local Government and Democratic Governance (15-). Sanath Jayasuriya MTR 74,352 22 April 2010 26 June 2015 SLFP UPFA SLFP NG Deputy Minister of Postal Services (13-15). Deputy Minister of Provincial Councils and Regional Development (15-). Jayalath Jayawardena GAM 58,302 22 April 2010 30 May 2013 UNP UNF UNP Died. Replaced by Ajith Mannapperuma. Tissa Karalliyadde ANU 55,017 22 April 2010 26 June 2015 SLFP UPFA SLFP NG Minister of Child Development & Women's Affairs (10-15). Deputy Minister of Buddha Sasana and Democratic Rule (15). Akila Viraj Kariyawasam KUR 66,477 22 April 2010 26 June 2015 UNP UNF UNP NG Minister of Education (15-). Ravi Karunanayake COL 70,328 22 April 2010 26 June 2015 UNP UNF UNP NG Minister of Finance (15-). Gayantha Karunatileka GAL 49,945 22 April 2010 26 June 2015 UNP UNF UNP NG Minister of Mass Media and Parliamentary Affairs (15-). Chief Government Whip (15-). Jayantha Ketagoda COL 22,193 8 March 2011 26 June 2015 DNA UPFA Replaces Sarath Fonseka. Nirmala Kotalawala KAL 82,044 22 April 2010 26 June 2015 SLFP UPFA SLFP UPFA Deputy Minister of Highways (10). Deputy Minister of Ports & Highways (10-13). Project Minister of Ports & Highways (13-15). Jeewan Kumaranatunga COL 51,080 22 April 2010 26 June 2015 SLFP UPFA SLFP NG Minister of Posts & Telecommunication (10). Minister of Postal Services (10-15). State Minister of Labour (15-). Gamini Lokuge COL 49,750 22 April 2010 26 June 2015 UNP (D) UPFA UPFA Minister of Labour & Productivity Improvement (10-15). Vijayakala Maheswaran JAF 7,160 22 April 2010 26 June 2015 UNP UNF UNP NG Deputy Minister of Women’s Affairs (15-). Ajith Mannapperuma GAM 44,812 4 June 2013 26 June 2015 UNP UNP NG Replaces Jayalath Jayawardena. Noordeen Mashoor VAN 9,518 22 April 2010 2 December 2010 SLMC UNF SLMC UPFA Died. Replaced by Muthali Bawa Farook. H. R. Mithrapala KEG 37,745 22 April 2010 26 June 2015 SLFP UPFA SLFP UPFA Deputy Minister of Livestock Development (10-15). V. Muralitharan NAT 22 April 2010 26 June 2015 SLFP UPFA SLFP UPFA Deputy Minister of Resettlement (10-15). Faiszer Musthapha KAN 44,648 22 April 2010 26 June 2015 SLFP UPFA SLFP NG Deputy Minister of Environment (10). Deputy Minister of Technology & Research (10-13). Deputy Minister of Investment Promotion (13-14). State Minister of Aviation (15). Nishantha Muthuhettigama GAL 125,777 22 April 2010 26 June 2015 SLFP UPFA SLFP UPFA Deputy Minister of Minor Export Crop Promotion (13-15). Sarath Chandrasiri Muthukumarana ANU 44,645 22 April 2010 26 June 2015 SLFP UPFA SLFP UPFA Deputy Minister of Rehabilitation & Prison Reforms (13-15). Vasudeva Nanayakkara RAT 56,493 22 April 2010 26 June 2015 DLF UPFA DLF UPFA Minister of National Languages and Social Integration (10-15). S. B. Nawinne KUR 74,976 22 April 2010 26 June 2015 SLFP UPFA SLFP NG Minister of National Languages and Social Integration (10). Senior Minister of Consumer Welfare (10-15). Minister of Labour (15-). Y. G. Padmasiri KEG 61,582 22 April 2010 26 June 2015 LSSP UPFA LSSP UPFA Deputy Minister of Agriculture (13-15). G. L. Peiris NAT 22 April 2010 26 June 2015 UNP (D) UPFA UPFA Minister of External Affairs (10-15). Ajith Perera KAL 48,588 22 April 2010 26 June 2015 UNP UNF UNP NG Deputy Minister of Foreign Affairs (15-). Dilan Perera BAD 69,610 22 April 2010 26 June 2015 SLFP UPFA SLFP UPFA Deputy Minister of Public Administration & Home Affairs (10). Minister of Foreign Employment & Welfare (10-15). State Minister of Housing and Samurdhi (15). Felix Perera GAM 69,938 22 April 2010 26 June 2015 SLFP UPFA SLFP NG Minister of Social Services (10-15). Minister of Special Projects (15-). Gamini Jayawickrama Perera KUR 44,131 22 April 2010 26 June 2015 UNP UNF UNP NG Minister of Food Security (15-). Lakshman Wasantha Perera MTL 65,077 22 April 2010 26 June 2015 SLFP UPFA SLFP UPFA Deputy Minister of Industry & Commerce (13-15). M. Joseph Michael Perera NAT 22 April 2010 26 June 2015 UNP UNF UNP NG Minister of Home Affairs and Fisheries (15-). Neomal Perera PUT 32,781 22 April 2010 26 June 2015 UNP (D) UPFA UPFA Deputy Minister of Co-operatives & Internal Trade (10). Deputy Minister of External Affairs (10-15). Niroshan Perera PUT 28,077 22 April 2010 26 June 2015 UNP UNF UNP NG State Minister of Youth Affairs (15-). Victor Anthony Perera PUT 35,259 22 April 2010 26 June 2015 SLFP UPFA SLFP UPFA Deputy Minister of Coconut Development & Janatha Estate Development (13-15). A. D. Champika Premadasa KEG 40,914 22 April 2010 26 June 2015 UNP UNF UNP NG Deputy Minister of Industry and Commerce (15-). Sajith Premadasa HAM 74,467 22 April 2010 26 June 2015 UNP UNF UNP NG Minister of Housing and Samurdhi (15-). Susil Premajayanth COL 54,702 22 April 2010 26 June 2015 SLFP UPFA SLFP UPFA Minister of Petroleum Industries (10-13). Minister of Environment and Renewable Energy (13-15). Susantha Punchinilame TRI 22,820 22 April 2010 26 June 2015 UNP (D) UPFA UPFA Deputy Minister of Fisheries & Aquatic Resources Development (10-13). Deputy Minister of Economic Development (13-15). A. P. Jagath Pushpakumara MON 67,903 22 April 2010 26 June 2015 SLFP UPFA SLFP NG Deputy Minister of Agriculture (10). Minister of Coconut Development and Janatha Estate Development (10-15). Deputy Minister of Plantation Industries (15-). Velusami Radhakrishnan NUW 54,083 22 April 2010 26 June 2015 CWC UPFA UCPF NG Deputy Minister of Botanical Gardens & Public Recreation (14). State Minister of Education (15-). Basil Rajapaksa GAM 425,861 22 April 2010 26 June 2015 SLFP UPFA SLFP UPFA Minister of Economic Development (10-15). Chamal Rajapaksa HAM 79,648 22 April 2010 26 June 2015 SLFP UPFA SLFP UPFA Speaker (10-). Nirupama Rajapaksa HAM 39,025 22 April 2010 26 June 2015 SLFP UPFA SLFP UPFA Deputy Minister of Water Supply & Drainage (10-15). Wijeyadasa Rajapaksa COL 60,030 22 April 2010 26 June 2015 UNP UNF UNP NG Minister of Justice and Labour Relations (15-). Ranjan Ramanayake RAT 59,318 22 April 2010 26 June 2015 UNP UNF UNP NG Deputy Minister of Social Services, Welfare and Livestock Development (15-). Keheliya Rambukwella KAN 133,060 22 April 2010 26 June 2015 UNP (D) UPFA UPFA Minister of Mass Media and Information (10-15). Arjuna Ranatunga KAL 27,796 22 April 2010 26 June 2015 DNA SLFP NG Minister of Ports, Shipping and Aviation (15-). Champika Ranawaka COL 120,333 22 April 2010 26 June 2015 JHU UPFA JHU NG Minister of Power and Energy (10-13), (15-). Minister of Technology, Research and Atomic Energy (13-14). C. B. Rathnayake NUW 41,345 22 April 2010 26 June 2015 SLFP UPFA SLFP UPFA Minister of Sport (10). Minister of Private Transport Services (10-15). State Minister of Public Administration and Democratic Rule (15). Mahinda Samarasinghe KAL 97,778 22 April 2010 26 June 2015 SLFP UPFA SLFP NG Minister of Plantation Industries (10-15). State Minister of Finance (15-). Mangala Samaraweera MTR 59,836 22 April 2010 26 June 2015 SLFP (P) UNF UNP NG Minister of Foreign Affairs (15-). Rosy Senanayake COL 66,357 22 April 2010 26 June 2015 UNP UNF UNP NG State Minister of Children’s Affairs (15-). Wasantha Senanayake GAM 51,124 22 April 2010 26 June 2015 SLFP UPFA UNP NG Deputy Minister of Tourism and Sports (15-). Rajitha Senaratne KAL 66,710 22 April 2010 26 June 2015 UNP (D) UPFA SLFP NG Minister of Fisheries and Aquatic Resources Development (10-14). Minister of Health and Indigenous Medicine (15-). Sujeewa Senasinghe COL 52,559 22 April 2010 26 June 2015 UNP UNF UNP NG Deputy Minister of Justice and Labour Relations (15-). Athauda Senewiratne KEG 67,719 22 April 2010 26 June 2015 SLFP UPFA SLFP UPFA Minister of Justice (10). Senior Minister of Rural Affairs (10-15). John Senewiratne RAT 125,816 22 April 2010 26 June 2015 SLFP UPFA SLFP UPFA Minister of Public Administration and Home Affairs (10-15). Chief Opposition Whip (15-). Lakshman Senewiratne BAD 31,560 22 April 2010 26 June 2015 UNP UNF NG Minister of Productivity Information (10-15). Minister of Sugar Industry Development (13-15). Deputy Minister of Disaster Management (15-). Mervyn Silva GAM 151,085 22 April 2010 26 June 2015 SLFP UPFA SLFP UPFA Deputy Minister of Mass Media & Information (10); DM for Highways (10), (10). Minister of Public Relations and Public Affairs (10-15). Maithripala Sirisena POL 90,118 22 April 2010 9 January 2015 SLFP UPFA SLFP Minister of Health (10-14). Elected President. Replaced by Jayasinghe Bandara . Muthu Sivalingam NAT 22 April 2010 26 June 2015 CWC UPFA CWC UPFA Deputy Minister of Economic Development (10-15). Ranjith Siyambalapitiya KEG 141,935 22 April 2010 26 June 2015 SLFP UPFA SLFP NG Deputy Minister of Economic Development (10). Minister of Telecommunications and Information Technology (10-15). Deputy Minister of Home Affairs (15-). State Minister of Environment (15-). Gamini Vijith Vijithamuni Soysa MON 54,516 22 April 2010 26 June 2015 SLFP UPFA SLFP NG Deputy Minister of Rehabilitation & Prison Reforms (10). Deputy Minister of Education (10-13). Minister of Wildlife Resources Conservation (13-15). Minister of Irrigation (15-). C. A. Suriyaarachchi POL 44,356 22 April 2010 26 June 2015 UNP (D) UPFA NG Deputy Minister of Social Services (10-15). Deputy Minister of Lands (15-). D. M. Swaminathan NAT 22 April 2010 26 June 2015 UNP UNF UNP NG Minister of Resettlement, Reconstruction and Hindu Religious Affairs (15-). Janaka Bandara Tennakoon MTL 47,133 22 April 2010 26 June 2015 SLFP UPFA SLFP NG Minister of Lands and Land Development (10-15). Minister of Provincial Councils and Local Development (15-). M. S. Thowfeek TRI 23,588 22 April 2010 26 June 2015 SLMC UNF SLMC NG Deputy Minister of Internal Transport (15-). Dayasritha Thissera PUT 38,704 22 April 2010 26 June 2015 SLFP UPFA SLFP NG Deputy Minister of Ports & Aviation (10). Minister of State Resources and Enterprise Development (10-15). Deputy Minister of Fisheries (15-). Arumugan Thondaman NUW 60,997 22 April 2010 26 June 2015 CWC UPFA CWC UPFA Minister of Livestock Development (10-15). K. Velayudam BAD 25,056 8 August 2014 26 June 2015 UNP UNP NG Replaces Harin Fernando. State Minister of Plantation Industries (15-). Tissa Vitharana NAT 22 April 2010 26 June 2015 LSSP UPFA LSSP UPFA Minister of Technology and Research (10). Senior Minister of Scientific Affairs (10-15). Pavithra Devi Wanniarachchi RAT 110,220 22 April 2010 26 June 2015 SLFP UPFA SLFP UPFA Minister of National Heritage & Cultural Affairs (10). Minister of Technology and Research (10-13). Minister of Power and Energy (13-15). State Minister of Environment (15). Dilip Wedaarachchi HAM 47,160 22 April 2010 26 June 2015 UNP UNF UNP NG State Minister of Fisheries (15-). Chandima Weerakkody GAL 67,231 22 April 2010 26 June 2015 SLFP UPFA SLFP UPFA Deputy Speaker & Chairman of Committees (10-). Gunaratna Weerakoon GAL 68,629 22 April 2010 26 June 2015 SLFP UPFA SLFP UPFA Deputy Minister of National Heritage & Cultural Affairs (10). Minister of Resettlement (10-15). Sarath Weerasekara AMP 54,373 22 April 2010 26 June 2015 SLFP UPFA SLFP UPFA Deputy Minister of Labour & Labour Relations (13-15). Wimal Weerawansa COL 280,672 22 April 2010 26 June 2015 NFF UPFA NFF UPFA Minister of Construction, Engineering Services, Housing and Common Amenities (10-15). Kumara Welgama KAL 124,766 22 April 2010 26 June 2015 SLFP UPFA SLFP UPFA Minister of Transport (10-15). Ratnasiri Wickremanayake NAT 22 April 2010 26 June 2015 SLFP UPFA SLFP UPFA Minister of Public Management Reforms (10). Senior Minister of Good Governance & Infrastructure (10-15). Eran Wickremaratne NAT 22 April 2010 26 June 2015 UNP UNF UNP NG Deputy Minister of Highways, Higher Education and Investment Promotion (15-). Neranjan Wickremasinghe KUR 54,572 22 April 2010 12 May 2015 SLFP UPFA SLFP NG Deputy Minister of Public Order and Christian Religious Affairs (15). Died. Replaced by R. D. Wimaladasa. Ranil Wickremasinghe COL 232,957 22 April 2010 26 June 2015 UNP UNF UNP NG Leader of the Opposition (10-15). Prime Minister (15-). Minister of Policy Planning, Economics Affairs, Child, Youth and Cultural Affairs (15-). Duleep Wijesekera GAM 51,469 22 April 2010 26 June 2015 SLFP UPFA SLFP UPFA Deputy Minister of Disaster Management (10-15). Rajiva Wijesinha NAT 22 April 2010 26 June 2015 LP UPFA LP State Minister of Higher Education (15). Ruwan Wijewardene GAM 88,850 22 April 2010 26 June 2015 UNP UNF UNP NG State Minister of Defence (15-). R. D. Wimaladasa KUR 44,728 20 May 2015 26 June 2015 SLFP UPFA SLFP UPFA Replaces Neranjan Wickremasinghe. Anura Priyadharshana Yapa KUR 98,880 22 April 2010 26 June 2015 SLFP UPFA SLFP UPFA Minister of Environment (10-13). Minister of Petroleum Industries (13-15). ^ The EPDP contested separately in Vanni and with the United People's Freedom Alliance in all other districts. ^ a b The UCPF contested separately in Badulla and Nuwara Eliya, and with the United People's Freedom Alliance in all other districts. ^ The UNF contested under the name and symbol of United National Party. ^ The TNA contested under the name and symbol of Illankai Tamil Arasu Kachchi. ^ The TNPF contested under the name and symbol of All Ceylon Tamil Congress. ^ "Parliamentary General Election – 2010". Department of Elections, Sri Lanka. Archived from the original on 21 April 2010. Retrieved 2 May 2010. ^ "Parliamentary General Election 2010 - Official Results". Department of Elections, Sri Lanka. ^ "Parliamentary General Election 2010". Department of Elections, Sri Lanka. ^ "New Parliament sworn in". The Daily Mirror (Sri Lanka). 22 April 2010. Retrieved 2 May 2010. ^ "Chamal Rajapakse new Speaker, Fonseka attends parliament". TamilNet. 22 April 2010. Retrieved 2 May 2010. ^ Indrajith, Saman (23 April 2010). "New Parliament sworn in: Chamal elected Speaker unanimously Ranil recognised as Opposition Leader". The Island (Sri Lanka). Retrieved 2 May 2010. ^ "Amaratunga is Opposition Whip". The Daily Mirror (Sri Lanka). 22 April 2010. Archived from the original on 2010-04-26. Retrieved 8 May 2010. ^ "Leader of the House re-appointed". BBC Sinhala. 2 May 2010. Retrieved 8 May 2010. ^ "New Deputy Speaker". The Daily Mirror (Sri Lanka). 24 November 2010. Archived from the original on 19 July 2011. ^ "D.M Jayaratne sworn in as PM". The Daily Mirror (Sri Lanka). 21 April 2010. Retrieved 2 May 2010. ^ Edirisinghe, Dasun (24 April 2010). "All Cabinet posts equal, essential for development – MR". The Island (Sri Lanka). Retrieved 2 May 2010. ^ "Mervyn resigns from media". The Daily Mirror (Sri Lanka). 5 May 2010. Retrieved 8 May 2010. ^ "4 Sri Lankan ministers, 6 deputy ministers take oaths". TamilNet. 5 May 2010. Retrieved 8 May 2010. ^ Bandara, Kelum (11 August 2010). "Mervyn sacked". The Daily Mirror (Sri Lanka). ^ Expected exoneration for Mervyn (1 September 2010). "Expected exoneration for Mervyn". The Daily Mirror (Sri Lanka). Archived from the original on 4 September 2010. ^ "Mervyn is back". The Daily Mirror (Sri Lanka). 8 September 2010. ^ "Rajapaksa appoints 59 member-cabinet". TamilNet. 22 November 2010. ^ "Number of Cabinet ministers in SL government rises to 61, deputies 34". TamilNet. 25 November 2010. ^ "Seniors kicked up in jumbo cabinet". The Sunday Times (Sri Lanka). 28 November 2010. ^ "Chandrasena resigns, Ranjith to be CM". The Daily Mirror (Sri Lanka). 19 September 2012. ^ "S.M Chandrasena sworn as a Deputy Minister". The Sunday Times (Sri Lanka). 5 October 2012. ^ "Cabinet reshuffled". The Daily Mirror (Sri Lanka). 28 January 2013. ^ Edirisinghe, Dasun (29 January 2013). "Reshuffle: No major shocks but Cabinet increases to 57". The Island (Sri Lanka). ^ "Govt. faces probe by independent UN body". The Sunday Times (Sri Lanka). 3 February 2013. ^ "Nine new Dy. Ministers". The Daily Mirror (Sri Lanka). 10 October 2013. ^ "Nine new deputy ministers sworn in". The Island (Sri Lanka). 11 October 2013. ^ Edirisinghe, Dasun (11 October 2013). "Now, two-thirds of govt. MPs holding portfolios". The Island (Sri Lanka). ^ "For whose good?". Daily FT. 12 October 2013. ^ "Another Cabinet Minister sworn in". The Daily Mirror (Sri Lanka). 23 November 2013. ^ "New Cabinet Minister sworn in". Ceylon Today. 23 November 2013. Archived from the original on 25 November 2013. ^ Somawardana, Melissa (21 August 2014). "Prabha Ganesan and Digambaran sworn in as Deputy Ministers". News First. ^ "Two more Deputy Ministers take oaths before President in Si Lanka". Colombo Page. 21 August 2014. ^ "Radhakrishnan appointed deputy minister". The Daily Mirror (Sri Lanka). 10 October 2014. ^ Perera, Yohan (23 April 2010). "Workers Union leaves UNF". The Daily Mirror (Sri Lanka). Archived from the original on 2010-04-26. Retrieved 2010-05-03. ^ Indrajith, Saman (23 April 2010). "NUW to back govt". The Island (Sri Lanka). ^ "Mangala joins UNP". The Daily Mirror (Sri Lanka). 6 August 2010. ^ "DPF suspends Praba Ganesan for 'betraying' party, Tamils". TamilNet. 6 August 2010. ^ Jabbar, Zacki (28 August 2010). "SLMC backs MR's constitutional amendment proposals". The Island (Sri Lanka). ^ "UNP cross overs". The Daily Mirror (Sri Lanka). 8 September 2010. ^ "18th Amendment Passed". Sunday Leader. 8 September 2010. ^ "MPs suspended". The Daily Mirror (Sri Lanka). 8 September 2010. ^ Wamanan, Arthur (12 June 2011). "TNA defector will not join TMVP". The Nation (Sri Lanka). ^ "CWC MP Goes Independent". The Sunday Leader. 11 September 2010. ^ "Parliamentarian Radhakrishnan to lead UPF political wing". TamilNet. 8 October 2010. ^ "SLMC officially crosses over to government". TamilNet. 22 November 2010. ^ Bandara, Kelum (13 November 2010). "SLMC decides to join govt". The Daily Mirror (Sri Lanka). Archived from the original on 19 July 2011. ^ "Split in Wimal Weerawanse led NFF". TamilNet. 24 December 2010. ^ Palihawadana, Norman (1 December 2011). "Grero's exit: UNPrebels blame party Grero's exit: UNPrebels blame party". The Island (Sri Lanka). ^ "Grero - Monitoring MP, Ministry of Education". The Daily Mirror (Sri Lanka). 2 December 2011. ^ "DNA MP Ajith Kumara to act as Independent MP". Ceylon Today. 15 November 2012. ^ Samuel, Anuradha (21 February 2015). "JVP leaders betrayed the struggle – Ajith Kumara". Ceylon Today. ^ "CWC MP resigns from party". The Daily Mirror (Sri Lanka). 8 August 2013. ^ "JHU breaks away from Rajapaksa's ruling UPFA". TamilNet. 18 November 2014. ^ "Video: UPFA MP Wasantha joins UNP". The Daily Mirror (Sri Lanka). 20 November 2014. ^ "I'm the common candidate: Maithripala". Daily Mirror. 21 November 2014. Archived from the original on 2014-12-17. Retrieved 2014-12-13. ^ "Maithripala named common candidate". The Nation (Sri Lanka). 21 November 2014. Archived from the original on November 29, 2014. ^ "Chandrika, Rajitha, Arjuna, Rajeeva, M K D S and Dumindha Dissanayaka join Maithripala". Hiru News. 21 November 2014. Archived from the original on 21 November 2014. ^ "CWC MP quits UPFA, joins UNP". Daily FT. 26 November 2014. Archived from the original on 2014-12-13. Retrieved 2014-12-13. ^ Borham, Maneshka (25 November 2014). "UPFA MP crosses over". The Nation (Sri Lanka). Archived from the original on November 27, 2014. ^ "Hunais Farook joins the UNP". The Nation (Sri Lanka). 26 November 2014. Archived from the original on December 12, 2014. ^ "Video: UPFA MP Farook joins UNP". The Daily Mirror (Sri Lanka). 26 November 2014. ^ Ferdinando, Shamindra (1 December 2014). "Navin joins Opp campaign to abolish presidency". The Island. ^ "Opposition parties launch bid to topple Rajapakse". Gulf Times. Agence France-Presse. 30 November 2014. ^ "Tissa Attanayake sworn in as Minister of Health". The Nation (Sri Lanka). 11 December 2014. Archived from the original on December 13, 2014. ^ Ferdinando, Shamindra (11 December 2014). "Two deputy ministers quit; CWC suffers split". The Island. ^ Srinivasan, Meera (11 December 2014). "2 more MPs leave Rajapaksa government". The Hindu. ^ "Controversial SL minister Badurdeen backs Sirisena". TamilNet. 22 December 2014. ^ Bandara, Kelum (23 December 2014). "Rishad's party splits; Hizbullah remains with MR". The Daily Mirror (Sri Lanka). ^ "ACMC splits following Bathiudeen's decision to support opposition". The Island (Sri Lanka). 25 December 2014. ^ Srinivasan, Meera (1 January 2015). "Deputy Minister in Rajapaksa govt. defects to Opposition". The Hindu. ^ "Sri Lanka's casino champion switches to opposition". Daily Mail. Agence France-Presse. 31 December 2014. ^ "Video: Nandimithra Ekanayake for Maitri". The Daily Mirror (Sri Lanka). 1 January 2015. ^ Warnakulasuriya, Deepal (1 January 2015). "Deputy Minister Nandimithra joins Maithri camp". The Nation (Sri Lanka). Archived from the original on January 1, 2015. ^ "Rajiva sits in the opposition". The Daily Mirror (Sri Lanka). 17 March 2015. ^ "Rajiva crosses over". Ceylon Today. 17 March 2015. ^ "Arjuna joins SLFP". The Daily Mirror (Sri Lanka). 18 March 2015. ^ Gooneratne, Lankesh (19 March 2015). "Arjuna joins SLFP". Ceylon Today. ^ Pradeep, Chaturanga (2 April 2015). "Karaliyadda resigns". The Daily Mirror (Sri Lanka). ^ Somarathna, Rasika (3 April 2015). "Deputy Minister Tissa Karaliyadda resigns". Daily News (Sri Lanka). Archived from the original on 11 April 2015. ^ "Tense situation at UNP meeting". dailymirror.lk. ^ "Four SLFP ministers resign". The Daily Mirror (Sri Lanka). 21 May 2015. ^ "Four Ministers resign". The Nation (Sri Lanka). 21 May 2015. ^ "Five new UPFA ministers appointed". Daily FT. 30 May 2015. ^ "Five new ministers appointed". Ceylon Today. 29 May 2015. ^ "Four SLFP deputy ministers appointed". The Daily Mirror (Sri Lanka). 10 June 2015. ^ "Four new Deputy Ministers sworn in". The Nation (Sri Lanka). 10 June 2015. ^ Perera, Yohan (8 October 2010). "Fonseka seat vacant". The Daily Mirror (Sri Lanka). Archived from the original on 10 October 2010. ^ "Sri Lanka ex-army chief Fonseka loses seat as MP". BBC News. 7 October 2010. ^ "Ketagoda sworn in as MP". The Daily Mirror (Sri Lanka). 9 March 2011. Archived from the original on 19 July 2011. ^ "Vanni parliamentarian Mashoor dies of heart attack". TamilNet. 2 December 2010. ^ "Parliament". Daily News (Sri Lanka). 6 January 2011. Archived from the original on 2011-01-10. Retrieved 2011-02-05. ^ "Malini Fonseka resigns". The Daily Mirror (Sri Lanka). 24 September 2012. ^ "Malini Fonseka takes oath as Parliamentarian". Ceylon Today. 9 October 2012. Archived from the original on 31 January 2016. ^ Haviland, Charles (30 May 2013). "Sri Lankan rights campaigner Jayalath Jayawardena dies". BBC News. ^ "VIDEO: Jayalath Jayawardena passes away". adaderana.lk. 30 May 2013. ^ "Ajith Manaperuma sworn in as MP". Ceylon Today. 4 June 2013. Archived from the original on 5 November 2013. ^ "New UNP MP sworn-in". The Daily Mirror (Sri Lanka). 4 June 2013. ^ "UNP MP Dayasiri resigns to contest as CM". The Sunday Times (Sri Lanka). 24 July 2013. Archived from the original on 5 August 2013. ^ "'I leave with my head held high' - Dayasiri". The Nation (Sri Lanka). 24 July 2013. Archived from the original on September 26, 2013. ^ Weerakoon, Gagani (8 August 2013). "Nilantha Bandara replaces Dayasiri". Ceylon Today. Archived from the original on 11 August 2013. ^ "New opposition MP takes oath in Sri Lanka parliament". Colombo Page. 8 August 2013. ^ "Harin resigns". The Daily Mirror (Sri Lanka). 5 August 2014. ^ Hemmathagama, Ashwin (6 August 2014). "Harin resigns from Parliament". Daily FT. Archived from the original on 13 December 2014. ^ "Velayudhan sworn in to replace Harin". The Nation (Sri Lanka). 8 August 2014. Archived from the original on August 15, 2014. ^ "Velayudhan replaces Harin at parliament". Ceylon Today. 8 August 2014. Archived from the original on 13 December 2014. ^ "Azwer resigns from Parliament". The Daily Mirror (Sri Lanka). 28 November 2014. ^ Alahakoon, Ajith (30 November 2014). "Azwer resigns as UPFA National List MP; Ameer appointed". The Island (Sri Lanka). ^ "Ameer Ali now an MP". The Daily Mirror (Sri Lanka). 12 December 2014. ^ "New MP sworn in". Ceylon Today. 29 January 2015. ^ "Bandara gets Sirisena's seat". The Island (Sri Lanka). 30 January 2015. ^ "Deputy Minister Wickramasinghe dies". The Island (Sri Lanka). 13 May 2015. ^ "Deputy Minister Neranjan passes away". Ceylon Today. 12 May 2015. ^ "New MP takes oaths New MP takes oaths". The Island (Sri Lanka). 21 May 2015. "PART I : SECTION (I) — GENERAL Government Notifications THE PARLIAMENTARY ELECTIONS ACT, No. 1 OF 1981" (PDF). The Gazette of the Democratic Socialist Republic of Sri Lanka Extraordinary. 1649/2. 12 April 2010. Archived from the original (PDF) on 2010-05-25. Retrieved 2013-02-03. "PART I : SECTION (I) — GENERAL Government Notifications THE PARLIAMENTARY ELECTIONS ACT, No. 1 OF 1981" (PDF). The Gazette of the Democratic Socialist Republic of Sri Lanka Extraordinary. 1650/15. 21 April 2010. Archived from the original (PDF) on 2010-05-25. Retrieved 2013-02-03. "PART I : SECTION (I) — GENERAL Government Notifications THE PARLIAMENTARY ELECTIONS ACT, No. 1 OF 1981" (PDF). The Gazette of the Democratic Socialist Republic of Sri Lanka Extraordinary. 1650/19. 21 April 2010. Archived from the original (PDF) on 14 December 2014. "General Elections 2010 - Preferential Votes" (PDF). The Sunday Times (Sri Lanka). 11 April 2010. "PART I : SECTION (I) — GENERAL Appointments & c., by the President" (PDF). The Gazette of the Democratic Socialist Republic of Sri Lanka Extraordinary. 1681/2. 22 November 2010. Archived from the original (PDF) on 22 February 2014. "60 ministers, 31 deputy ministers sworn in yesterday". The Daily Mirror (Sri Lanka). 23 November 2010. Archived from the original on 25 November 2010. "NEW FACES BOOST CABINET AS HOPES RISE". The Nation (Sri Lanka). 28 November 2010. Archived from the original on 2016-03-04. Retrieved 2010-12-24. "PART I : SECTION (I) — GENERAL Government Notifications" (PDF). The Gazette of the Democratic Socialist Republic of Sri Lanka Extraordinary. 1778/29. 4 October 2012. Archived from the original (PDF) on 2012-12-01. Retrieved 2013-02-03. "PART I : SECTION (I) — GENERAL Appointments & c., by the President" (PDF). The Gazette of the Democratic Socialist Republic of Sri Lanka Extraordinary. 1779/6. 8 October 2012. Archived from the original (PDF) on 2012-12-02. Retrieved 2013-02-03. "PART I : SECTION (I) — GENERAL Appointments & c., by the President" (PDF). The Gazette of the Democratic Socialist Republic of Sri Lanka Extraordinary. 1795/43. 31 January 2013. Archived from the original (PDF) on 2013-05-31. Retrieved 2013-02-03. "PART I : SECTION (I) — GENERAL Appointments & c., by the President" (PDF). The Gazette of the Democratic Socialist Republic of Sri Lanka Extraordinary. 1832/16. 14 October 2013. Archived from the original (PDF) on 2013-10-20. Retrieved 2013-10-19. "PART I : SECTION (I) — GENERAL Government Notifications PROCLAMATION" (PDF). The Gazette of the Democratic Socialist Republic of Sri Lanka Extraordinary. 1896/29. 10 January 2015. Archived from the original (PDF) on 28 January 2015. "PART I : SECTION (I) — GENERAL Appointments & c., by the President" (PDF). The Gazette of the Democratic Socialist Republic of Sri Lanka Extraordinary. 1897/16. 18 January 2015. Archived from the original (PDF) on 28 January 2015. "PART I : SECTION (I) — GENERAL Appointments & c., by the President" (PDF). The Gazette of the Democratic Socialist Republic of Sri Lanka Extraordinary. 1898/70. 23 January 2015. Archived from the original (PDF) on 2015-01-28. Retrieved 2015-01-24.